Top . History . Extra . Relationships . Char is a demon boss, who commands the largest Demon Horde/army in all the land. Those who are unprotected by the gates of a great city's walls (such as the Hunters or the Slayers cities), fear the very mention of his name, as if the breath of it might summon his wrath upon their persons. This is not an idle threat either, as in some cases, it very well can summon him this way! When his demon horde is on the move, it appears as a hazy black wind throughout the land- tearing up whatever village or structure that stands in its path and killing or kidnapping those the demons within it encounters. Entering the horde, as it rages, is like stepping into a tornado of teeth and claws. A frenzy of blood thirsty demons, ready to tear apart anything and everything, and continues to hunger for more! Char himself, is not known for his kindness either. Walking at the center of the horde, as it powers on, not even the demons in his horde will venture close to him while they move, leaving him in a large clearing, surrounded by the storm of demons- much like the eye of the storm, it's silent where he stands. Char is an unpredictable monster, bent on chaos and enjoying the sight of those weaker than him, squirm under his heavy presence. His aura has a pull to it, that everyone can feel when he's nearby. To weaker souls, it feels as if it's tightening the very air they breath. Demons, who are not a part of his massive horde army, often are in a constant state of watching their backs- hoping that they don't come across him or any of his loyal gang members, for if they do, they run the risk of being forced into service under him, whether they want to or not. There are positives to joining Char's horde, however, as it is a great form of 'protection' from various threats to a demon, 'innocently' living it's life in the land alone. These threats being mainly: the watchful eyes of Demon Hunters, who's powerful city and villages, trains skillful human warriors, knowledgeable in the way of capturing demons and imprisoning them for study, as well as other purposes; and the Demon Slayers, who's cities are filled with angry humans, bent on destroying any demon they come across in the lands, regardless of their sins. Joining Char's horde put's an end to these fears, and empowers those who joins, particularly those who join willingly, if the demon is smart. Unwilling demons will have a black band attached to their body somewhere (usually the wrist or ankle, but sometimes the neck), which seals that particular demon to Char himself. It's powers being usable by Char, and if something were to happen to Char- be it a fatal wound, the wearer of a black band will die as well. Char is a greedy demon master. He desires more demons for his horde, above all else, he wants power. He wants to be stronger than any that appose him. He lives for the fear in the eyes of those that see him, and takes whatever he wants, WHOEVER he wants, and uses them to his own gains. With this being said, Char also has a unique relationship with a pair of Demon Hunters: both Astasia and Zerek. He often encounters them upon his Horde raids in the land- as they are out to 'protect those that cannot protect themselves' (or something foolish like that), and he enjoys playfully fighting with them whenever they encounter him alone. It being much more sinister play fighting on his part, than their futile attempts at 'capturing him' ever are. Char has had plenty of chances to kill either of them, but enjoys the game of cat and mouse. One day, however, when the game becomes tiresome, he plans to fully seize them as human slaves. Underneath the mask he wears, Char's face is a melted monstrosity. Without his mask, he's in agonizing pain, and is completely blind. It's a weakness he guards most fervently and there are few who know of what lies behind the mask. This curse he wears, was brought onto him by the Fire Lord 'Garanzo': The demon King of Hell's desert gates. Garanzo was Char's master in Hell, and before Char successfully fled to the living realm, Garanzo cursed Char's eyes, blinding him to the realms above. In particular, Garanzo was the very reason Char fled to another plane in the first place, and he knows that if he were to return to his king, his eyes and sight, will be restored; the curse lifted. An enticing taunt to his freedom, that should he choose to end his suffering, he need only return to his king Hell. Char refuses to die. Ever. Remaining in agony, simply to spit in the face of Garanzo's cruel joke. This part of Char's past is secret, and known only to him, for if one was to find out, who he was... what he was, he would honestly never live it down. A lowly servant, a 'lapdog' of the almighty and terrible Fire Lord- if you think Char is nasty, Garanzo is worse. Far worse. When Char first entered the realm of the living- fearful and in blind anguish, Char lived 100 years, wandering aimlessly, searching for relief to the continuous fire that plagued his face. His peril finally coming to an end when he stumbles- quite literally, into Whorker's hut. Whorker, being an ex 'Torture demon', who had recently entered the realm of life, from his lair in Hell, (to start a new life away from the tiring and thankless work of 'creating demons' from human souls he pulls from purgatory), his skills in 'creation', become him a powerful 'healer' in the realm of life that he now puts to good use, healing demons and others alike, that come to him in need (for a fee). Whorker is still unable to cure Char fully. This Curse that attacks Char's face, is created by the one creature whose magic Whorker cannot rebuff: A Fire Lord. With this being said, Whorker is still able to craft Char an enchanted mask, using a pair of magically enhanced eyes embedded within the mask itself, allowing Char to see fully, as if with his own vision, and as an added gesture, removes the pain in his face, while wearing it (Char had to actually beg on all fours for this 'feature', as Whorker wasn't going to include it. Char didn't have enough to pay him with at the time, but Whorker wanted the demon off his doorstep, and couldn't kill Char without alerting the Fire Lord to his own crimes of escape to a life realm, so Whorker put the pain removal feature into the mask enchantment, as a 'merciful' gesture, to their dealings.). - In Hell, Char's original name is 'Syvern'. - To avoid being 'recognized' by Hellspawn demons: (demons who originally escaped Hell and were not 'born' into a life realm), living in the life realm, he changed his name to Char. 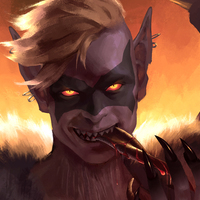 Char has yet to meet any Hellspawn that knows his face from his time as a servant in Hell, but there are plenty of Hellspawn that know the name 'Syvern', as that is the name of Garanzo's favourite servant... the one that escaped. Should someone discover Char's real identity, they could heavily use it to blackmail him into doing just about anything, to avoid being exposed. - He has 3 sons, which he created, mostly out of 'curiosity' (as no children are ever born in Hell), from a human woman who gains his unfortunate 'attention' in the life realm. She dies during childbirth. His sons like to call themselves 'The Blade Brothers', and they go by the names, 'Toru, Torch, and Core'. Char learns of the chaos that bestows the hunter kingdom, this taking place many years after Zerek's unfortunate death, and due to a horde breaking out within the city because of Grieve. Char leads his horde to overtake and merge with the one being formed- adding increased chaos and death to the kingdom residents and bringing upon the fall of the demon hunter empire. Thus, he creates the largest horde in existence within the life realm, and is powerful enough to overtake any other kingdom should he wish to. With nothing to stop him, he becomes the conqueror of the entire continent, quickly setting his sights to the rest of the planet. 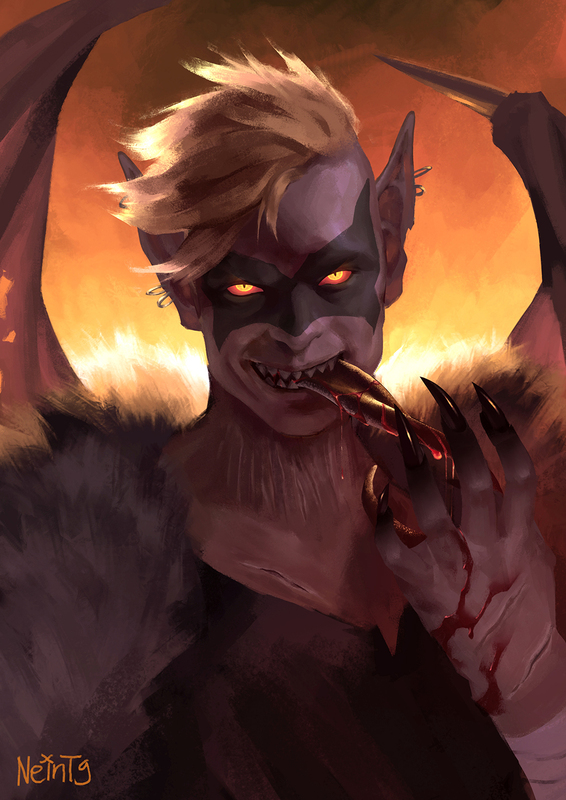 His horde spanning all throughout the land, owning all but some of the most elusive demons (CUTTS being one of the demon's to continually escape his grasp, and whose presence had all but vanished once Char came into full power. He's out there somewhere, hiding like a coward). Humans are few and far between, and only those villages he deems worthy of sticking around, live in fear of his possible attacks, if their offerings to him are not adequate enough. This is the world in which demonoid Zerek enters into, when he finally returns to the realm of life (having 'escaped' Hell as well). In the fall of the hunter kingdom however, Astasia's life was lost. Char refused to lose her soul, his greediness to own everything he desires being quick to overcome him, and in his haste, seals her soul within her fallen body. For over 400 years she remained stuck within the moments of death, unable to move on, or 'move' at all for that matter. Her body kept pristine, and untouched within his volcanic lair where his horde resides, perfect and magically mummified, a true 'trophy' of conquests. Unknowing to Char (or perhaps he just didn't care), that Astasia's soul began to warp and bend with madness within her lifeless corpse, begging for release. It is in this state, that demonoid Zerek discovers her- and by merely making light contact with her skin, sets her corrupt soul free. His own magics, and the reunion of their two souls, breaking the seal that binds her to her dead body. Astasia's compressed and angry soul power leads to the eruption of the seemingly dormant volcano. Char, in a state of panic by the thought of dying, attempts to flee the scene, but is rebuffed by Astasia's mad spirit. Char is unable to escape in time, burning alive with the rest of his demon horde as the innards of the volcano erupts around him. At long last, returning to Hell, where he is reunited with the warm comforts of his master's loving embrace... having become Syvern once more. Char fears Garanzo, and never wants to see the treacherous Fire Lord ever again. The melted holes under his mask burns whenever he so much as thinks of the demon king. Char has made it his soul duty to never die and return to Hell - if that were to happen... no it will never happen! Hates his guts for being the reason he was tethered to Garanzo's side, in the first place. His only regret, after escaping Hell, was not getting the chance to obliterate Reighan's soul from existence before he left. He hopes he rots under Garanzo's violent rule. Char recognizes Zerek, but can't quite place where he knows this demon from. Char and his horde has consumed the land, and reigns supreme, leaving few demons free of the horde, and even fewer humans left alive in the entire continent they reside in. Upon their first encounter within the ruins of an old hunter city from 400 years prior, Char sends the might of his horde after Zerek to capture him, as all demons must join his horde, or suffer the consequences. However, the demon slips away with the help of a mysterious small and blue hair'd demon Char has also never seen before. He remains searching for them until their second encounter, where Char learns his name: Zerek. It can be no coincidence! As he chases after the elusive yet powerful little enchanter- Malka, Char comes into contact with Zekiel. Instantly dropping what he's doing and attempting to capture another Hellspawn- dweller of Hell. After the demon threatens him with knowledge he couldn't possibly know, Char backs off, but does not forget... Zekiel dares threaten him like this? He'll find a way around this little 'dilemma', then he'll pay... Malka too. ... they both will.